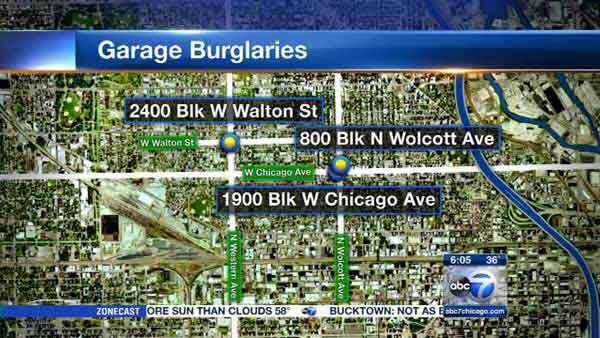 CHICAGO (WLS) -- Police are warning residents of burglars targeting garages in Chicago's West Town neighborhood. Three garages were broken into in the past week. In each case, police said the suspects forced their way through garage doors and took property from inside. One garage in the 2400-block of West Walton Street was burglarized around 9 a.m. on March 23, another in the 1900-block of West Chicago Avenue around 12 p.m. on March 25 and a third garage in the 800-block of North Wolcott Avenue around 8 a.m. on March 27. Police did not release a suspect description. Anyone with information regarding these garage burglaries should contact Area Central detectives at (312) 747-8382.